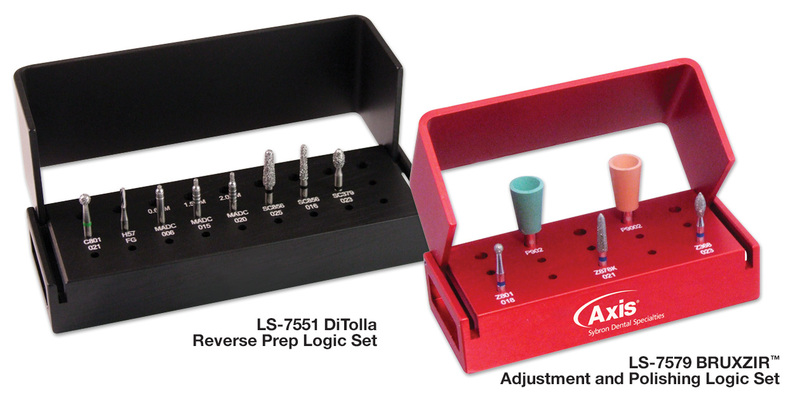 Logic sets contain the essential instruments necessary to achieve optimal results in preparing, finishing and polishing all restorations. Developed by Dr. Michael DiTolla, the Reverse Preparation technique is designed to ensure adequate reduction, making margin preparation as simple as possible. Contains: 1 autoclavable bur block, 4 diamond instruments (379-023, 856-016, 856-025, 801-021), 3 axial reduction burs (MADC-006, MADC-015, MADC-020), 1 carbide bur (H57-010). Designed for smooth post-cementation adjustments to zirconia, then finishing to a high polish shine. Contains: 1 autoclavable bur block, 3 ZirCut diamond instruments (Z801, Z878K, Z368), 2 zirconia polishing cups (P902, P9002).